I’ve just launched a new series of student workshops and teacher training seminars on travel journaling and essay writing, and cross-cultural adaptation and discovery. 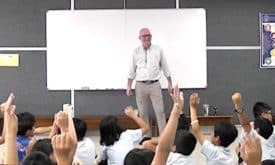 Designed for international school and university educational travel programs, my student workshops include fun, hands-on writing and discussion exercises. They can be tailored to fit any age group from elementary / primary school to the university level. My teacher training seminars help educational trip leaders offer more immersive cultural experiences. We explore writing and group discussion techniques to help students absorb and process their cross-cultural encounters. These workshops also offer effective methods for assessing student participation and discovery on school trips. I live in Vietnam, but I’m willing to travel just about anywhere if you have a budget to get me there. If you are an educator at an international school or a university that would be interested in hiring me to speak, you can learn more at Globejotting.com/edu.